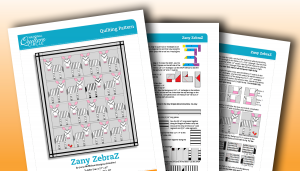 The Zebra pattern includes instructions for making both a toddler sized quilt finishing at 57″ x 67″ and a baby sized quilt finishing at 40″ x 50″. 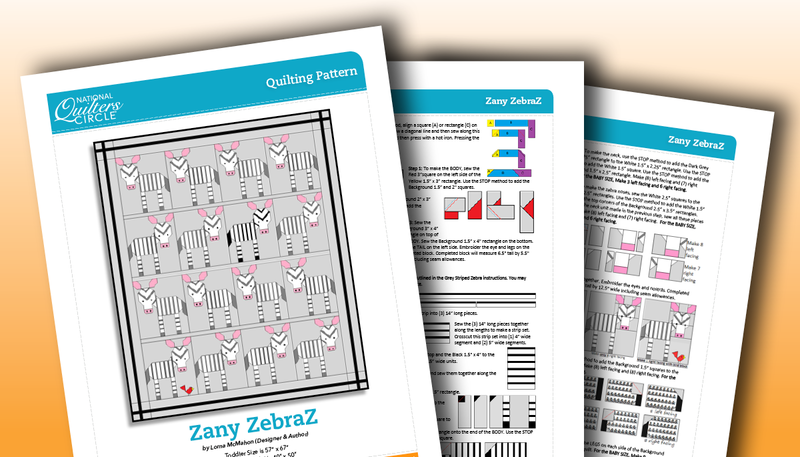 The zebra blocks are NOT paper pieced, but instead, these are strip pieced which makes it more fun and less work! The body parts are cut from the strip sets. The pattern includes instructions for making both a toddler sized quilt using a 16 block setting, finishing at 57″ x 67″ and a baby sized quilt using a 9 block setting and finishing at 40″ x 50″. Material requirements lists for both setting sizes and both block methods are provided. Complete instructions for making the both the pieced ZebraZ and the Cheater ZebraZ in either setting are included. The Zebra blocks finish at 12” wide x 14” tall. This pattern is delivered as an 11-page Downloadable PDF, which you can view and/or print.